There are about as many tricks for learning the times tables as there are students learning them. The one thing they all agree upon is the notion that children simply must learn them. There’s really no way around it. We’ve tried a plethora of different methods for teaching the boys (Seahawk and Munchkin) the times tables. While they’ve done okay at learning them (they can almost always figure out the answer, but they definitely don’t have them memorized), nothing has really made them stick. Until now. Thanks to The Trigger Memory Co. and their Times Tales videos, my kids are finally – finally – remembering the multiplication tables. I received these videos as downloadable files (currently on sale for $19.95; regular price $21.95), and printable worksheets were included. My laptop doesn’t have a whole lot of memory, and it’s not really conducive for us to use Will’s computer for school stuff, so I had to come up with a way that would work for us to use a downloadable product. Here’s what I ended up doing: First, I downloaded the videos and worksheets to Will’s computer. Then I uploaded them to my Dropbox account. This allowed us to stream the videos, which was perfect for us. The download files are quite large (two 30-minute videos, after all), so if you don’t have access to good (read: huge – preferably unlimited – bandwidth/upload/download speeds . . . I’m not entirely sure what the right terminology here is) internet, then the downloads probably aren’t the best choice for you. 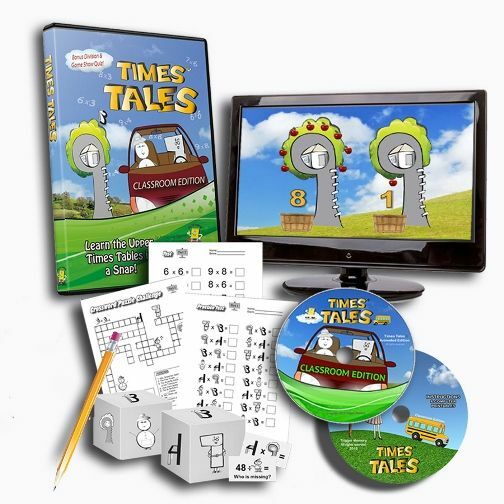 Never fear, though; Times Tales is also available in DVD format for $24.95. The downloads and DVDs are identical in content. 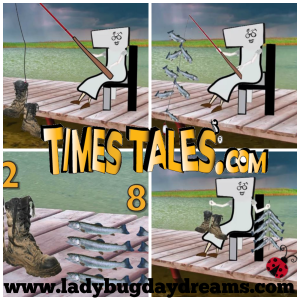 Mrs. Week sits on a chair to go fishing. She catches 2 boots and 8 trout. Because Mrs. Week represents the number 7 and the chair represents 4, the problem is 7×4. 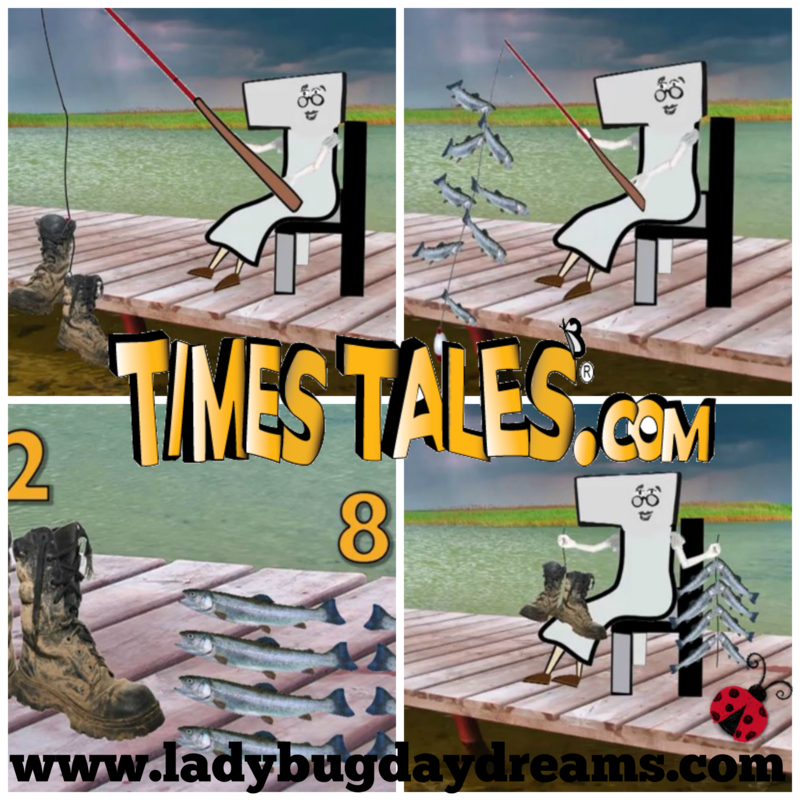 The 2 boots are the tens column of the answer, and the 8 trout are the ones. Therefore, 7×4=28. Students are instructed that the order of the stories is important (because 7 times 4 does not equal 82). Each story is accompanied by simple animation to help bring them to life. Each video is approximately half an hour, so it’s not a hardship to spend the time watching. The idea is that you watch the first video, work through the stories and worksheets and games to encourage memorization, and then one week later – just one week – move on to the second video. By the end of two weeks, students know all of the upper times tables. In addition to the videos, there are printable worksheets to go along with the curriculum. Included in the worksheets are a crossword puzzle (for story recollection), several pages of flashcards, a practice test (using the characters), a final test (using the “regular” numbers), and cut-out-and-fold dice for a practice game. The dice game was one of the highlights of this product for us. We all had fun rolling the dice and telling the stories to each other. My favorite part of this program? It actually works! The kids learned the stories (quickly), and were able to translate them into multiplication problems. And they’re remembering the problems/stories/answers. What a blessing this has been! And guess what? Small Fry (3 years old) has memorized the stories, too. He doesn’t quite understand what they mean, but he knows them. I’m pretty sure this means that when he’s old enough to learn the times tables himself, it will be a breeze – not the hardship it’s been for the older two. Times Tales has been a welcome addition to our homeschool. If you have students just learning (or struggling) with their multiplication tables, this is definitely a product you should try. They even have a 20-minute video on their YouTube channel that shows you their method using just the 9s. If you’re at all skeptical, check that out first. When your child masters the 9s in just a few minutes, you’ll be a convert too! This review is brought to you by the Schoolhouse Review Crew. There are loads of other families reviewing Times Tales this week, so don’t just take my word for how great this product is – read other reviews, too.